I am joining my friends from Kid Blogger Network in a round up of topics interesting for parents and caregivers looking for fun activities to do with their kids. 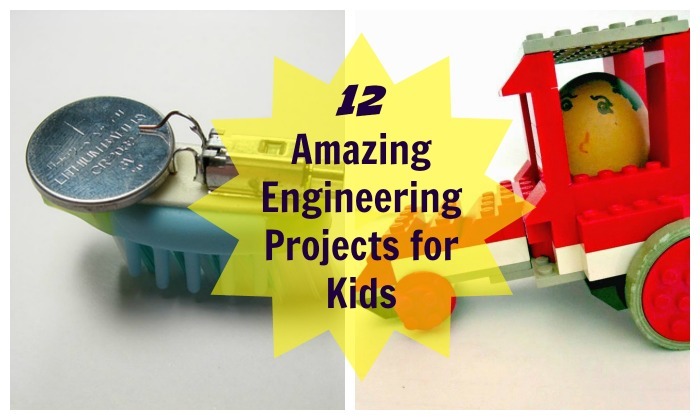 Since my 7 year old is very convinced that she will become an engineer, specifically, a mechanical engineer, I want to share 12 amazing engineering projects for kids from the blogosphere including, of course, ideas from this blog. You can treat this project as an engineering challenge or follow an excellent toy parachute tutorial from Zakka Life. And check out this terrific round up of crafts that fly from The Pleasantest Thing. 2. Be a Junk Modeler! Cardboard is a cheap and easily available material for young engineers. Build a cardboard city from Lemon Lime Adventures or visit my blog buddy Mama Smiles: Joyful Parenting who guest posted on In the Playroom about 10 wondrous things one can do with cardboard boxes. I like this “industrial strength” geoboard from Crayon Box Chronicles because my 7 year old can practice screwing bolts and then play with her new board. Definitely doing one this summer! Everyone loves flinging objects across some distance, and there are several ways to build catapults including an open ended “engineering challenge” project. 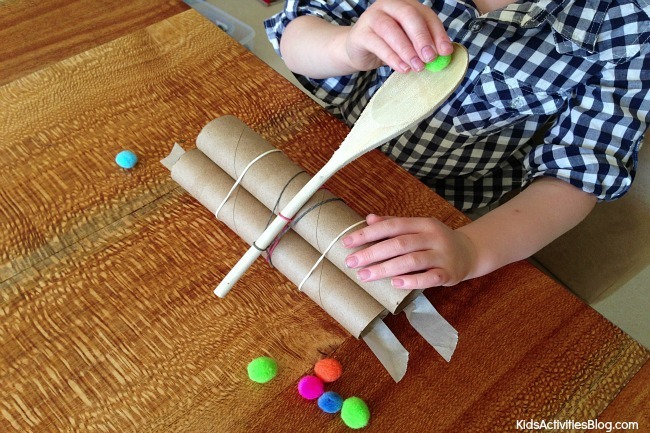 I like this simple catapult from Kids Activities Blog , and this post also contains links to more advanced catapult version. Designing the boat that floats was the first engineering challenge for my 7 year old and her friend, and it was fun to see how they approached this task. Clearly, my daughter still needs to learn a lot before becoming an engineer. Testing different designs of airplanes is fun by itself, but Frugal Fun 4 Boys took it to the next level with a DIY paper airplane launcher. Future engineers need to understand forces of nature. Science Sparks has a brilliant post about forces and a great project to go with it – a balloon powered Lego car. I pinned this propeller-powered car from Instructables as a potential summer project, but my daughter did something very similar this week in Camp Galileo (sponsored link), except her car their was driven by a sail. This was another engineering challenge that we had around Easter – first we made egg drivers and then each of us designed a race car for our drivers.. Of course, Papa’s car won! Robots hold endless fascination for future engineers. I am intrigued by this bristle bot from Evil Mad Scientist. I also highly recommend to check out this Really Rocking Robot Roundup from Brain Power Boy. We have a marble run set, and Smarty enjoys trying out different configurations, but I still have a self-made marble run on the list of things to do. I love this simple DIY marble run from toilet paper rolls from TinkerLab, but Buggy and Buddy has a great round up of homemade marble run ideas to choose from. Last, but not least Almost Unschoolers is a treasure trove of great ideas for older kids. She has several great ice architecture ideas including this Ice Cube Roman Arch.